datingscams.cc at WI. DatingScams.cc: The online database of dating scammers. 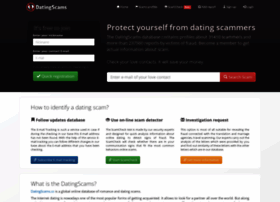 DatingScams - The global online database of marriage and dating scammers. User profiles on our website are written by appeals over a thousand people who have been defrauded for hundreds and sometimes thousands of dollars by Internet contacts they thought were their friends or loved ones on dating websites or other.